The structure and rules of an organisation can say much about its culture and vision. This is particularly true of the Scottish Labour Party. In my article in the latest Citizen and in my contributions to both recent Scottish Labour grassroots events, organisation was just one of four points on my Scottish Labour 'to do' list. However, as Johann has now resigned, citing some of these reasons, I think I am justified in saying a bit more on this issue. When you open the rule book of any organisation you expect to get a feel for the purpose of the entity. What it exists for, its mission and through the dry stuff of structures and standing orders, how it does its business. That also tells you something about its culture, it's engagement with its members and so on. When you open the rule book of the Scottish Labour Party you get very little sense of this. It is an untidy miss mash of provisions, some out of date, some contradictory, but very little coherence. Much of this is down to the complex and difficult links with the UK Labour Party rule book that has never adjusted to devolution. I have probably written more papers on the Scottish Labour Party rules than everyone else put together, so I admit to a certain level of frustration. Successive General Secretary's, and I have been through a few, have said to me, 'in practice does it matter because we generally do what we need to do anyway?" Well, I would suggest that recent events demonstrates that it does matter, on a political level as well as on a organisational one. It matters organisationally because while the Labour Party is rightly credited with legislating for devolution, it has never really adjusted its internal workings to match political devolution. The 2011 review resulted in some important changes, but even those haven't been completed and the consequential issues have not been addressed. The Falkirk debacle illustrates the problem well. It was dealt with badly, by a remote London HQ because it was viewed as a Westminster selection issue. It was also a constituency management issue, but the rules have never addressed the consequences of reorganising constituencies on Scottish Parliament boundaries. The result was that the Leader of the Scottish Labour Party was left as an observer on the biggest political story of the day. Another long standing issue has been the management of staff who work in Scottish Labour HQ. They are NEC employees and struggle to manage a relationship between their line manager in London and their day to day responsibilities to the SEC and Leader in Scotland. Ian Price, a decent and competent official, is the latest victim of that matrix. "And just as the SNP must embrace that devolution is the settled will of the Scottish people, the Labour Party must recognise that the Scottish party has to be autonomous and not just a branch office of a party based in London. Scotland has chosen to remain in partnership with our neighbours in the UK. But Scotland is distinct and colleagues must recognise that. There is a danger of Scottish politics being between two sets of dinosaurs … the Nationalists who can’t accept they were rejected by the people, and some colleagues at Westminster who think nothing has changed." Just how out of touch was brought home to many of us in the trade union movement at last week's STUC 'Decent Work, Dignified Lives' conference. Most of civil society was represented and the First Minister readily accepted an invitation to speak. It was the Holyrood recess and the conference subject readily lent itself to a Westminster Labour spokesperson. The response, we can't attend because it clashes with Scottish Questions at Westminster. Bluntly, no one in Scotland, outwith the Westminster bubble, gives a toss about Scottish questions. It sadly reflects misplaced priorities. Johann's resignation interview also refers to the culture of political spin, even against comrades in the party. To that I would add the old style negative campaign techniques that have not served us well. The polls show that the main reason for voting Yes, by a mile, was "dissatisfaction with Westminster politics". While this may be a bit of a catch all, it does represent a widespread view that the 'Westminster Bubble' is remote and out of touch and a way of doing politics that we need to move away from. Internal devolution is also reflected in the Labour response to political devolution and the Smith Commission. Labour's Devolution Commission was the inevitable compromise with a reluctant Westminster establishment that has never fully adjusted to devolution. In the spirit of the current Scottish political environment it looks even more timid than it did at the time. Of course none of this should distract us from the need to get the politics right. Powers, internal and external are only useful if they are used for a purpose. The Red Paper Collective and others have set out a new approach. Neil Findlay's article in the Morning Star and his speech today sets out clearly how the New Labour coalition was let down by much of what happened in government. He also didn't miss the SNP's contradictions and failure to seriously address social justice. That renewed purpose has to create a vision of clear red water between Scottish Labour and its political opponents. The idea that we can win from the right is dangerously absurd. That vision has to be illustrated by radical, yet practical policies that make a real difference to the lives of people in Scotland. Devolving energy policy would tidy up the often conflicting mix of devolved and reserved powers and enable Scotland to develop new approaches to energy policy. At present energy is a largely reserved matter to Westminster. Specific reservations in Schedule 5 of the Scotland Act 1998 include the generation, transmission, distribution and supply of electricity; the ownership of, exploration for and exploitation of deposits of oil and natural gas; Coal, including its ownership and exploitation; Nuclear energy and nuclear installations. However, secondary legislation has devolved aspects of these powers including the Renewables Obligation in Scotland and consent for power stations greater than 50MW onshore and 1MW offshore. Perhaps even more importantly, environmental legislation and planning are fully devolved matters. The Scottish Government has used these powers to set more ambitious targets for reducing greenhouse gas emissions by 42% by 2020 (UK target 34%); 20% of all energy from renewables by 2020 (UK target 15%); and finally aims to decarbonise electricity generation by 2030 (no UK target). Most notably, the Scottish Government has used its planning powers to rule out new nuclear power stations, although supporting life extensions to existing capacity. These conflicts have resulted in well publicised disagreements over issues like transmission charges that discriminate against Scottish generators; Electricity Market Reform (EMR), support for renewables and subsidies for nuclear power. The Scottish Government believes that the Scottish Parliament should have greater responsibility for all energy policy and regulation, including all oil and gas. They argue this would deliver a streamlined approach and allow Scotland to design a regulatory and fiscal landscape which maximises the return from the energy sector, encouraging a sustainable industry for the benefit of the people of Scotland. This would include joint oversight of UK-wide bodies such as OFGEM, and an arrangement of shared competence in relation to the new Oil and Gas Authority proposed for Aberdeen. With these additional responsibilities, it is argued that Scotland could also capitalise more fully on its comparative advantages in the energy field. The Scottish Government could advance community and local ownership of energy; and better address societal inequalities through tackling fuel poverty. The connection of the islands to the national grid could also be prioritised. There is of course a certain irony in the Scottish Government’s position. In the referendum they claimed Scotland would remain part of the UK energy market, despite the obvious consequences for renewables. Scotland gets a third of the UK’s renewable support with less than a tenth of the population. The Scottish Government’s claim that the lights would go out in England without Scottish renewables, was simply not credible. The rest of the UK has a wide range of options, including new interconnectors to Europe and their capacity margins will be tightest when the wind isn’t blowing. So, intermittent Scottish renewables would be the wrong energy at the wrong time. Having powers is all very well, but the acid test is how you use them. A Scottish energy policy should use our abundant renewable energy resources, within a balanced UK and Scottish energy system. A planned energy policy than relies less on the vagaries of the ‘kid on’ energy market and makes a real contribution to reducing greenhouse gas emissions. A formal role in regulation will support the necessary reform of the regulatory system, including transmission charges and retail prices. That links energy efficiency, price and welfare – the three elements that are needed to tackle fuel poverty. It can also link already devolved matters such as training and education to address the workforce skills gap. We set out these approaches in more detail in our policy paper ‘Scotland’s Energy-Scotland’s Future’. There are international precedents for devolving energy powers. For example, Greenland and the Faroe Islands have devolved energy powers within Denmark. In recent years there has been renewed interest in local generation with local government leading the way in countries like Germany. We need to break away from the big business model of energy that is concentrating wealth in the hands of foreign corporations. One of the strengths of devolution is the ability of smaller parts of the UK to try different approaches. Scotland could be radical and innovative, with the devolved powers and the political will to use them. UNISON has long argued that energy policy should be devolved to Scotland. It would tidy up the current mismatch of powers that allows governments to stop developments rather than encouraging new approaches. The UK would benefit from the innovation and Scotland would take responsibility rather than looking to others. That looks like a win-win for everyone within these isles. Scotland's public services are living through a lost decade as a consequence of austerity economics. 'Austerity Economics Don't Add Up' is the title of UNISON Scotland's latest report on the impact austerity economics is having on our public services and the staff who deliver them. "The constitutional debate in Scotland may divide over independence or further devolution. But what unites Scotland is a desire to challenge poverty and create a more equal society. Its not about the ‘45 per cent’ or the ‘55 per cent’ – its about the 99 per cent who understand that a more equal society benefits us all. The message from Scotland this week is that we all deserve to live in a society that puts people first, where the economy is run for everyone, not just the well off." 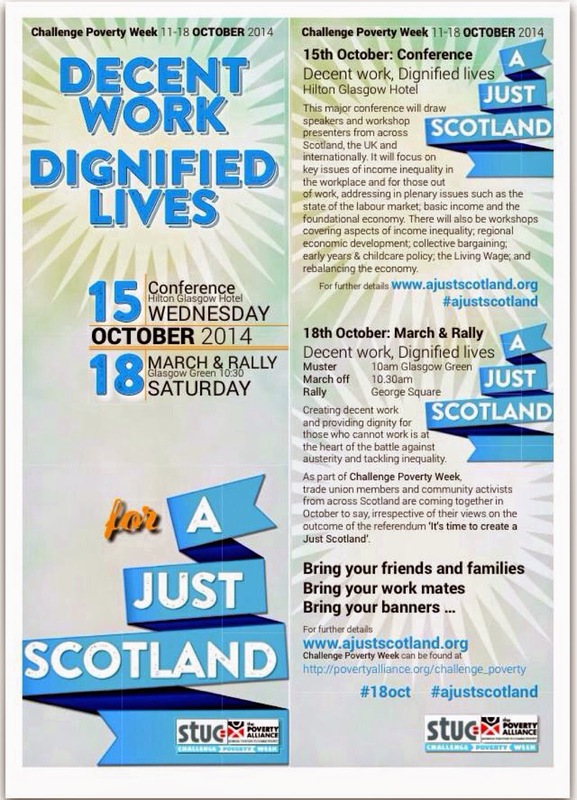 Looking forward to seeing everyone tomorrow in Glasgow for the 'Decent Work, Dignified Lives' march and rally. 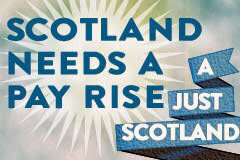 Scotland deserves a pay rise! 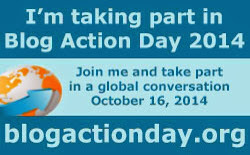 Today is Blog Action Day and the subject for this year is inequality. Very appropriate here in Scotland as this is Challenge Poverty Week and I make no apology for returning to this issue. Yesterday, the STUC 'Decent Work, Dignified Lives' conference had a real focus on inequality with some excellent contributions that will be available on line. Professor David Bell and David Eiser from Stirling University gave a very clear analysis of inequality in Scotland. They argued that the trickle down economics of the Thatcher era have been successfully challenged in books like 'The Spirit Level' and the more recent work by the French economist Thomas Picketty. There is growing wider acceptance of the damage inequality does from contributors as diverse as the ILO, The Pope, Mark Carney and the World Bank. Even the IMF now accept that redistribution doesn't have a negative impact on growth. The determinants of inequality are even better understood. Technological change and globalisation have changed trade, corporate power and deregulated labour markets. Taxation and benefits can have intended consequences towards redistribution, but regulation can have negative unintended consequences. For example, the price of utilities has been driven up by privatisation and regulation and that has a bigger impact on the poor because essentials constitute a larger part of their income. The consequences are that as inequality rises the level of social mobility declines. In particular, there is less mobility between generations because wealth and other advantages are simply passed on to children. 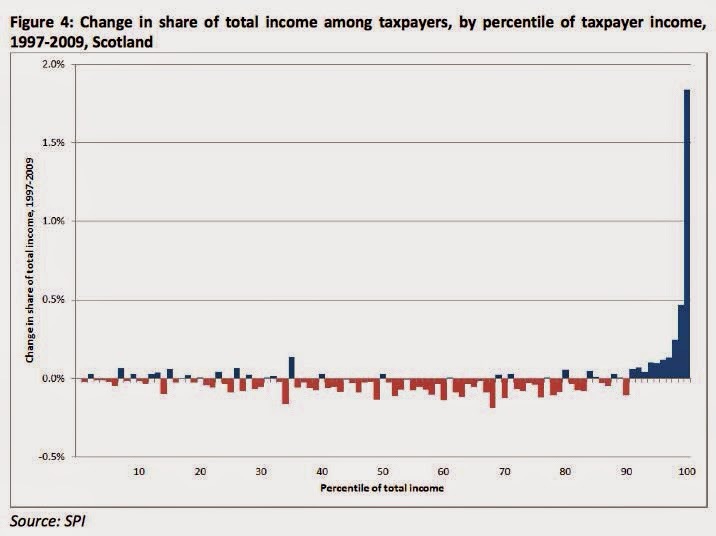 Income inequality in Scotland is similar to the rest of the UK when you take London out of the equation. While still high in the league table of inequality compared to other EU countries, our level of tax redistribution is about average. It's income before tax that pushes the UK up the league. So what should the policy responses be? The obvious startIng point is tax and benefits. The problem is that relatively small changes have a limited impact on equality. 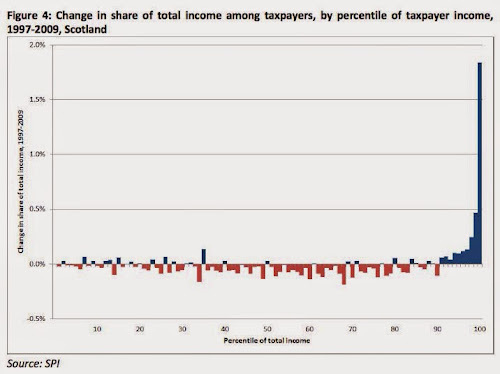 As highlighted above, it's income before tax that is a feature of inequality in the UK. The main impact of the benefit system is to subsidise poor employers, while tax cuts for the rich has just encouraged fat cat bosses to lobby for higher wages. The next area is labour regulation. The minimum wage does reduce inequality, primarily by improving wages at the very bottom, although it has not maintained differentials throughout the pay scales. Action on insecure employment would help, particularly access to employment justice and ending zero hours contracts. However, it is only through support for sectoral collective bargaining that we will make big strides forward in tackling inequality. Maximum wage or ratios are are also important as this week's IDS study shows - directors pay has grown from 40 times average earnings to 120 times since 2000. 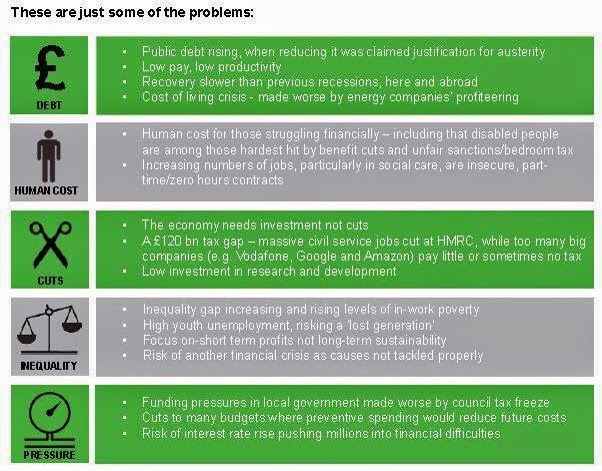 The third solution gets less attention - public services 'In kind' spending. As the OECD has highlighted, income inequality in the UK is mitigated by public spending. Preventative spending on health and education, particularly for the under three's, could have a major impact - tackling intergenerational Inequality. Government action can, albeit unintentionally, also exacerbate inequality. A good example of this is government driving down the cost of social care through lower wages and insecure working conditions for care workers. Public sector buying power should instead be used to positively address inequality. We cannot say often enough that a more equal society benefits everyone. A radical change of direction is required using a range of policy interventions. Progressive taxation, labour regulation and stronger public services would be a good start. This is Challenge Poverty Week in Scotland. There will be a series of events culminating in a march and rally In Glasgow on Saturday. The week started with the Poverty Alliance conference today. I was contributing to the final session and my focus was on the importance of reframing the narrative in the debate around poverty. For Cameron, it is all about the ‘strivers, not the skivers’. This is the strategy and language of despots and the far right for centuries. Find a minority to blame to distract the majority from the real problems in our society. A problem you could do something about, but choose instead to defend the vested interests of your class. 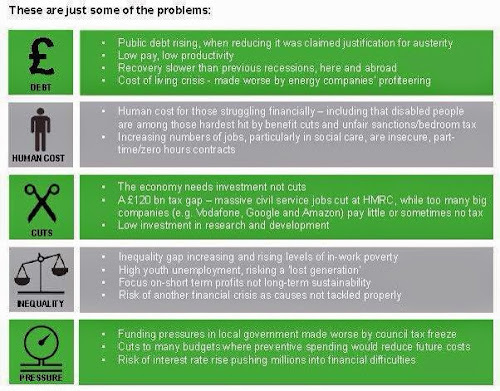 We need to reframe the narrative in opposition to welfare cuts and the political myth making that unfairly blames poverty on those struggling. The percentage of households below a minimum standard of living has doubled over the last 30 years. We can start by pointing out that more than half of those forced to claim benefits are the very ‘strivers’ that Cameron claims to represent. 52% of working age adults in poverty were living in households where at least one adult was in employment, as were 59% of children in poverty. This has happened because the economy has seen a big shift from wages to profits. You have to go back to the 1860’s for a pay squeeze as long as this one. If the wage bill had just kept up with inflation there would be £5bn more spending power in the Scottish economy. As we highlight in a UNISON Scotland report published today on wages, workers are struggling to meet even basic bills. Since 2007 the average rent for a Council House has increased by 26% and in the same time the wages of a Council Worker has increased by 8.3%. In today’s report we give a voice to many of our members who describe in their own words how they are struggling to make ends meet. Families have been plugging the gap by using savings or getting into debt. 30% of families say they have less than £500 put away, compared with just 14% in 2013. A deeply indebted economy may be a political strategy to get Cameron to the next General Election, but there will be a serious hangover after it. Even among those suffering, the pain is not evenly spread. Women in low pay have a pay gap of 34.2% and young workers classed as low paid has more than tripled over the past four decades. Of course there is a minority that Cameron is not blaming – the 1% who are doing very nicely thank you. The wealth of the richest 1,000 people in Britain doubled to £519 billion since 2009, about two and a half times the annual deficit. Today’s IDS study of FTSE 100 Directors shows that they had a 21% pay rise last year and now earn 120 times the average full time worker. In 2000 that ratio was 40 times. NHS workers in England are striking today, just get the Government to pay their own measly 1% pay policy. And this isn’t just about Russian oligarchs buying up mansions in Knightsbridge. It’s here in Scotland. An Edinburgh fund manager reported recently that 7 directors earned an average of £2.5m each and settled a post retirement benefit on a former director of £31m. There are some positive signs that we are not the only people who recognise the need to reframe the debate. The Pope, Governor of the Bank of England, even the CBI have said something about low wages and the damage it is doing to our economy. We may not get the bankers to even read The Spirit Level, but even they can see that they can't hide behind electric fences all the time. They can pay to get their bins uplifted, but their neighbours rats will still get under the fence. So, lets build on that growing awareness to build a broad coalition around a new narrative and some practical solutions. By all means let's engage with the Smith Commission to strengthen devolution, but then focus on what we can achieve at UK, Scottish and local levels. At today's conference there was a really useful discussion about how we can harness the energy of the referendum debate to deliver social justice. My frustration with the current political debate is that we need a little less rhetoric, telling people what they want to hear, and more action. For example, everyone agrees that the living wage can be expanded through procurement, but months after the Act was passed we haven't even begun to draft the statutory guidance. Meanwhile officials come up with every excuse for not taking action. The best engagement events during the referendum campaign were not the 'shouty' hustings, but rather the genuine conversations. Educate and agitate is an old trade union adage, but if you explain the issues to people, they are much more willing to consider and come up with different and challenging solutions. A different narrative in the debate around poverty is possible. We can win the arguments, persuade a majority that a more equal society is better for everyone, not just the poor. I am less interested in the 45 or the 55, than getting the 99%, who would benefit on our side. If we can do that we have a movement that really can create a just Scotland. Today, I was speaking at the Scottish Green Conference In Edinburgh. Credit to the Green's for an outward looking conference agenda, looking beyond the tribalism that is all too dominant in Scottish politics. My contribution to their economy debate focussed on wages, industrial relations and role of public services. The big story of the economy has been the shift from wages to profits. The share of wages as a percentage of national income has fallen from around 58% in the early 1980’s to 54% in 2011,while profit’s share has increased from 24% to 28% over the same period. I could churn out more numbers, but here’s a practical example. Since 2007 the average Rent for a Council House has increased by 26% - in the same time the wages of a Council Worker have increased by 8.3%. Or in the words of a hospital cleaner, "I just get by. Normally I am really struggling by week three. If my bills and rent go up any more I would not be able to live. Family holidays never happen". This matters for the economy as well as individuals. If the wage bill kept up with inflation there would be £5bn more spending power in Scottish economy. The combination of rising employment and falling pay growth shows the austerity economy is very good at creating low-paid jobs, but struggling to create the better-paid work we need for a fair and sustainable recovery. Of course not everyone is suffering. The wealth of the richest 1,000 people in Britain doubled to £519 billion since 2009, about two and a half times the annual deficit. They also dodge taxes with £120bn lost to the exchequer. Just think what those resources could do for our battered public services. Again a real example buried away in Herald business pages. In an Edinburgh fund manager, 7 directors earned an average of £2.5m each and they settled a post retirement benefit liability to a former director for £31m! How the 1% rip us off. If there are any positives it is that the damage this level of inequality does is beginning to be understood is less likely places. The Pope has highlighted the impact of inequality, even the CBI has said something about low wages. The Bank of England governor, Mark Carney said: "All ideologies are prone to extremes. Capitalism loses its sense of moderation when the belief in the power of the market enters the realm of faith. In the decades prior to the crisis, such radicalism came to dominate economic ideas and became a pattern of social behaviour." A few words about industrial relations, because strong trade unions and effective collective bargaining are the cornerstone of a more equal society. Last February the Scottish Government commissioned an independent review of progressive workplace policies and practices in the public and private sectors in Scotland. It was Chaired by Jim Mather and had a broad based membership. This report dispels many of the myths about relations between unions and employers, highlighting the positive relationships that rarely get media coverage. Scotland does of course benefit from significantly higher union density than the rest of the UK and report identified a shared ambition to embed progressive workplace practices to boost innovation and productivity and deliver successful organisations, sustainable business and economic growth, high-quality jobs and a more equitable society. There are 30 recommendations in the report that seek to deliver practical actions in support of the key themes. Most employers and trade unions in Scotland will welcome this report and look to the Scottish Government to translate their response to the recommendations into action. On public services much has been made income inequality in the UK, quoting the OECD report. But if you read that report the OECD also highlight key role public services play in creating a more equal society. Public services evolved due to the failure of the voluntary and private sectors to meet the needs of the people. While the well off could buy many things for themselves, infrastructure like roads, water supply and sewerage needed coordinated action and investment. Even the wealthy recognised that it was in their own self-interest to ensure that everyone had clean water to drink and wash in and that waste was dealt with, because everyone suffers when others aren’t covered. The vermin attracted to a street where only half the bins are emptied would be a problem for everyone. Scotland has local government but not many genuinely local councils. We have fewer councils and councillors than any other in Europe. Stronger local government needs a wider range of people as councillors, power over finances and integration with other services that are being increasingly centralised. Like equality, greater public ownership has widespread public support. Not Morrisonian nationalisation but new approaches. Polls show that two thirds believe public services should be provided in-house, not run like a business and with stronger user voice. One approach to financing services that generate revenue streams is to use some of the £24bn in Scottish local authority pensions funds, provided by workers and the taxpayer. Half that money is currently invested abroad. However, governance is weak with decisions driven by advice from the very same fund managers who got us into the current financial crisis. They also cream off profits for themselves in transaction charges. We need an active economic and industrial policy aimed at creating full employment, with quality jobs and a Just Transition to a low carbon economy. We must ensure equal pay is delivered and we should increase the National Minimum Wage in stages at least to the Living Wage level and extend the Living Wage to all workers on public service contracts, particularly in social care. Oppose welfare cuts and the political myth making that unfairly blames poverty on those struggling. Including the cut of £6 billion to welfare spending in Scotland. We need fair taxation and a crackdown on tax avoidance. Taxes are good value for money. Instead of tax cuts, we need to properly fund the public services that are currently so at risk. Tackling the UK tax gap of £32 billion, pursuing tax evasion to raise £90 billion and raising £23 billion annually with a Robin Hood Tax (Financial Transactions Tax). An end to the unfair council tax freeze which has cost more than £2.5 billion and benefits the better off most. Seeking a cross party consensus on funding local government. Of course we can and should make the case for more powers. UNISON has a detailed shopping list in our Fairer Scotland-Devolution paper and like others we are reviewing these proposals before making a submission to the Smith Commission. But we can do a lot in Scotland now. By all means argue for different constitutional arrangements, but let's get on with what we can now. There is a broad consensus that a fairer Scotland is possible, let's get on with it. A quick look at the draft Scottish budget indicates few surprises. Yet again public sector workers take the biggest hit through their pay packets, followed by councils and police staffs. While the headlines in the budget are around the fiscally neutral new taxes, it is the budget allocations that matter more to UNISON members. We should also remember that these are Scottish Government allocations. Public bodies will have other spending commitments to meet when they come to set their individual budgets. Over five years the Scottish budget has been cut by around 10% in real terms with the Capital budget facing a real terms cut of 26% as a result of the UK Government’s austerity programme. For the coming year this means a 1.7% real terms cut in the budget. The main method of meeting this budget reduction in Scotland is by a further cut in the real wages of public service workers. The new Scottish Government pay policy caps basic pay at one per cent for those staff earning above £21,000. That’s 1.4% below the rate of inflation (RPI 2.4%) and of course comes on top of years of pay cuts. There is a continued commitment to paying the Scottish Living Wage and guaranteeing a minimum increase of £300 for staff earning less than £21,000. · A real term increase in the NHS budget of £80m. It remains to be seen if that will cover the increased demands on health boards, highlighted in recent leaked reports. · The local government revenue grant is cut in real terms, with the exception of additional funding previously announced for free school meals. Extra revenue is anticipated from non-domestic rates and some additional capital leaving an overall standstill budget. The Council Tax freeze continues for the eighth year with no increase in funding. Local government remains the only major spending portfolio to have a cash cut since the financial crash. · An extra £125m for housing that should underpin the building of 4000 new social homes. · The spending to ameliorate the impact of UK government welfare cuts remains at £81m, including £35m on the Bedroom Tax. · Police budgets are cut in line with the planned ‘reform’ savings of £130m. Police numbers are maintained at the continued expense of civilian staff. Best value principles are ignored. · There is a slight increase in college spending and HE remains unchanged. · An additional £16.6 million to take forward recommendations of the Commission for Developing Scotland’s Young Workforce. The increase in infrastructure investment will primarily be funded through a growth in PPP schemes. £2.5bn of these projects are now in the pipeline. Overall there is little in the budget that was unexpected. Pay, local government and police take the biggest hit in the choices the Scottish Government has made in implementing the UK government’s ideological attack on public services. Scotland's housing crisis needs urgent action and the staff who deliver the service agree. UNISON Scotland has published a survey of Scotland’s housing staff today. It has exposed the reality of frontline staff trying to cope with the huge scale of Scotland’s housing crisis. 'Open the door: housing staff on the homes we have and the homes we need' – looks at the real experiences of members involved in all aspects of providing housing services: housing officers, housing assistants and lettings officers. The majority of those surveyed (68 per cent) said funding for their service had gone down, negatively impacting on the quality of service they can provide. Three quarters of respondents said changes in welfare and benefit legislation has contributed to the problem. At its bluntest, welfare changes have made life more difficult for tenants and this in turn has created problems for housing staff. "I work with homeless people. The pressure is increasing relentlessly. Demand is increasing as resources dwindle." "[Benefit changes] have impacted massively and it will only get worse. Rent arrears have risen and you cannot take what people don’t have." "Due to bedroom tax and direct payments of housing benefit to tenants we are seeing an increase in rent arrears and homeless rising due to more evictions." "How is it possible for them to provide for the future of their housing with less staff and more homelessness. It’s not possible." More than half of respondents (55 per cent) said they regularly work over their contracted hours while 58 per cent said staff numbers are in decline, meaning they don’t have as much time to spend with clients. Like other workers in public services, housing staff have been experiencing years of zero or minimal pay. Almost 70 per cent of workers said their standard of living had dropped in the previous three or four years, with many struggling to make ends meet. For those who like the numbers, they paint an equally depressing picture. Scotland has 179,954 households with outstanding applications for social housing; of these some 29,500 are households on transfer lists meaning 150,000 households are waiting to enter social housing. The response to this in terms of house building is woefully inadequate. Only 10,686 dwellings were built between March 2013-14 by the private sector, 2,911 dwellings built by housing associations and 974 dwellings built by local authorities. Allied to this are issues around the quality of housing. 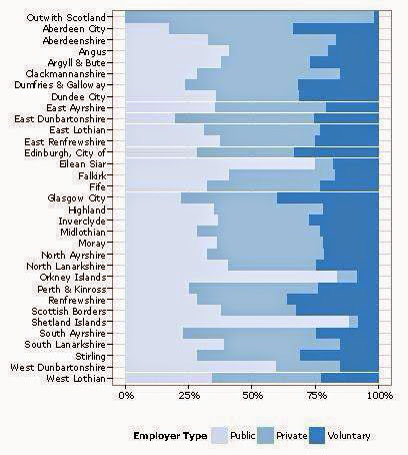 349,000 homes in Scotland are affected by dampness or condensation. 647,000 households are in fuel poverty in Scotland. A total of 54 per cent of Scotland’s social housing currently falls beneath the Scottish Housing Quality Standard. 65,000 households are overcrowded in Scotland. UNISON hasn't just outlined the inadequacy of current approaches. In our paper 'Making Homes for a Fairer Scotland' we outlined a new housing programme for Scotland. Equally importantly, we also showed how this could be funded, using some of the assets represented by public sector pension funds in our publication, 'Funding and Building the Homes Scotland Needs'. This would put these funds to a socially (and literally) constructive use in building a fairer Scotland. Alex Rowley MSP helpfully highlighted this plan in the recent debate on housing in the Scottish Parliament. We also need to devolve Housing Benefit. Responsibility for housing policy without the main benefit makes no sense. This appears to have welcome cross party support, so should be one of the easier issues for Lord Smith's commission to agree on. We need to do this quickly before Universal Credit is rolled out in Scotland and the experienced council staff transfer or leave the service. We have a crisis with the availability, the cost and the quality of our housing and we urgently need large scale investment to reverse Scotland’s housing crisis. Any plan for social justice in Scotland has to put housing at its core. "I’m positive about working with practitioners, negative about being subject to another layer of managerial agendas." "Lack of local authority care is resulting in delayed discharges within hospital wards which is placing greater strain on the NHS system. Sometimes packages of care are agreed and discharge is arranged but then there is physically not anyone to actually deliver the care"
Keir Hardie supported Home Rule for Scotland, but we should be wary about ascribing contemporary views to historical figures. However, there are lessons from his work that we should adopt today. 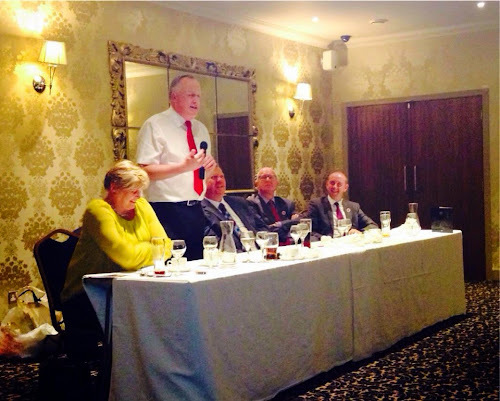 I was giving the James Keir Hardie Memorial Lecture last night, hosted by Uddingston and Bellshill CLP - which includes his birthplace. The Keir Hardie society not only seeks to remember the life and times of the great man, but also to promote his ideas in a modern context. With that aim, my focus was his views on Home Rule and the relevance for current political debate In Scotland. It is a bit of a challenge doing a Keir Hardie lecture as an after dinner speech. One thing the Keir Hardie Society won't be producing is a Keir Hardie joke book. As the Times Obituary rather harshly put it: "it was Mr Hardie's misfortune that he inherited more than an average share of Scottish dourness". Typically dismissive from the Times, but it does appear that humour was not one of the great man's rhetorical tools. In addition, he would certainly have frowned at the availability of alcohol at a political dinner! Hardie's first Scottish Labour manifesto famously called for; home rule, a minimum wage and temperance. While the big issue in Hardie's day was Irish Home Rule, he did support a Scottish Parliament. Home Rule can be an ambiguous title, but it is different from independence. Hardie was certainly not a nationalist. His life and work had an obvious UK and broader international solidarity context. My first job as a full time union official was in South Wales. I well remember attending a meeting in Merthyr Tydfil town hall where there was a wonderful bust of Keir Hardie - inspirational to a young idealistic union official. More recently, Newham council in London has published an excellent booklet commemorating Hardie's time as the MP for West Ham. It is hard to imagine an SNP politician standing for an English constituency! We should always be wary about attaching views on current issues to historical figures. Hardie's thoughts on Home Rule were penned more than 120 years ago in a very different political environment. Something nationalists and others would do well to remember. They usually write that Keir Hardie would be 'turning in his grave' at the actions of the Labour Party today. If they are going to do this it would help to do some basic research. Hardie wont be turning in his grave for anything - because he was cremated! More thoughtful arguments claiming Hardie would have supported independence come from Bob Holman - the author of an excellent concise biography of Hardie. He refers to Hardie's call for more working class MPs and railing against elitism of Westminster. Where I part company with Bob is the idea that the Scottish establishment is inherently more egalitarian. Gender balance, something he campaigned strongly on, yes, but that is largely due to the Scottish Labour Party's 50:50 policy, not the Parliament. Of course Hardie would have attacked privatisation and inequality, but these are political decisions of the Tories, who can be just as wicked as in Hardie's day. The White Paper was also short on substantive proposals that Hardie would have supported. In particular, not a single redistributive proposal, other than a tax handout to big business. In the lecture I set out my own post-referendum analysis. That is largely as outlined in my blog post at the time, so I won't repeat it here. Similarly, my views on further devolution and the Smith Commission is set out in my column in last week's Sunday Times. Finally, I do believe there were positives about referendum campaign including a revitalised discussion about politics that Hardie would have recognised as the norm in his day. In effect we have rediscovered that tradition. The other speaker at last night's event, Archie Macpherson, is an excellent example of the oral tradition and helped but some passion back into the No campaign. Hardie was no political theorist, so we shouldn't treat his words as some sort of bible. He said "I am an agitator. My work has consisted of trying to stir up divine discontent with wrong". That is the lesson we should take from his life today. He took the message of socialism to hundreds of thousands of ordinary people across the UK. He changed the way a generation thought about what was possible. An alternative vision of what today we would call social justice. If there is a lesson for the Scottish Labour Party today, it is the importance of communicating a radical vision of what is possible. Not the fantasy politics of those who claim to want social justice, but spend all their time attacking Labour. But neither is it the managerialism that sometimes dominates party policy. A fairer Scotland is possible and Scottish Labour should be its champion.